Monsoon is finally here! The frequent showers and of course the sun. This damages the skin making it tanned and dull. During this season we definitely require something to keep the tan in control and keep her skin fresh and glowing. After a lot of research, online Youtube tutorials and articles, I found this very effective scrub from The Body Shop. This scrub not only removes dead skin impurities but also tan due to excessive exposure to the sun. I went to Goa twice in two months and had this severe tan which I thought would be impossible to get rid off. Thankfully this scrub worked efficiently in getting back my natural skin color in a time span of almost a 2 weeks. 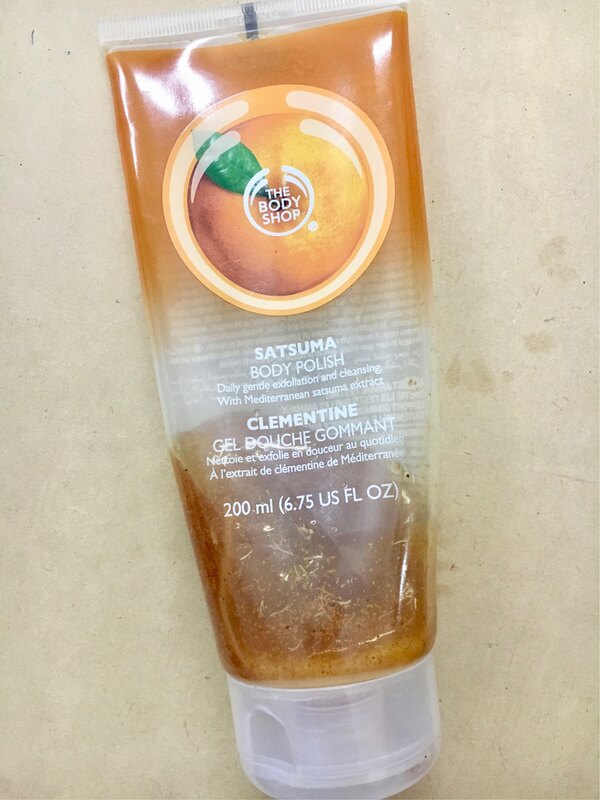 The name of the product is The Body Shop Satsuma Body Polish. 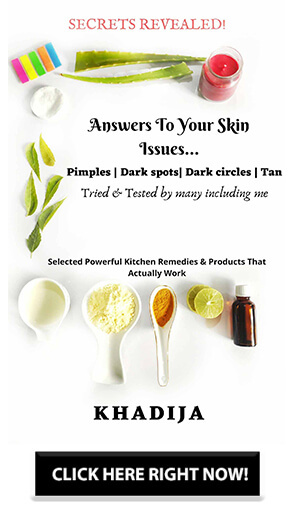 Read on to find my experience with this lovely product. Pick up our satsuma body polish to slough away dead skin cells, leaving your skin supremely softer and refined. The exfoliating foaming gel and energising scent adds a touch of luxury to your shower routine. 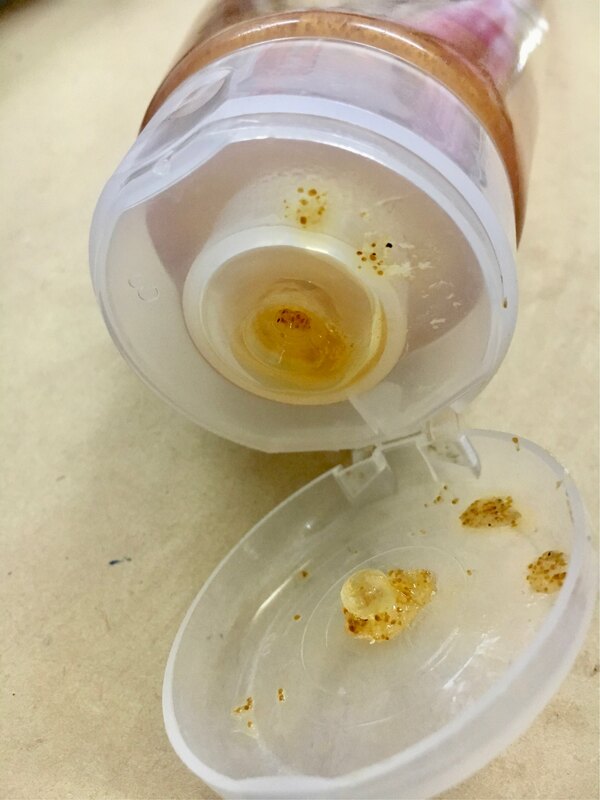 Aqua/Water/Eau, Sodium Laureth Sulfate, Cocamidopropyl Betaine, Glycerin, Acrylates Copolymer, Juglans Regia Shell Powder/Juglans Regia (Walnut) Shell Powder, Benzyl Alcohol, Phenoxyethanol, Sodium Chloride, Mel/Honey/Miel, Limonene, Parfum/Fragrance, Citrus Nobilis Fruit Extract/Citrus Nobilis (Mandarin Orange) Fruit Extract, Luffa Cylindrica Fruit, Sodium Hydroxide, Hexyl Cinnamal, Butyl Methoxydibenzoylmethane, Disodium EDTA, Citral, Denatonium Benzoate, Salicylic Acid, Sodium Dehydroacetate, CI 15510/Orange 4, CI 15985/Yellow 6. The Body Shop Satsuma Body Polish comes in a transparent plastic tube with a huge white flip-flop cap on it. Being a colorless tube, it is very easy to keep a check on the product quantity while using. The scrub does not spill out which prevents product wastage. You can find all the necessary information printed on the product itself. Overall the product comes in a hygienic and travel-friendly packaging. The scrub is semi-liquid in texture and has small scrubbing granules in it. The granules do not feel harsh on the skin while scrubbing. It spreads easily and only a small amount of it is good enough for one-time use. Most of the scrubs are extremely creamy, because of which a large amount of the product is required and definitely a lot of time is spent while scrubbing. This one is an absolute opposite and easy to use. The Body Shop products are known for their excellent aroma in almost all of their skincare products. This product also doesn’t disappoint when it comes to their unique smell. 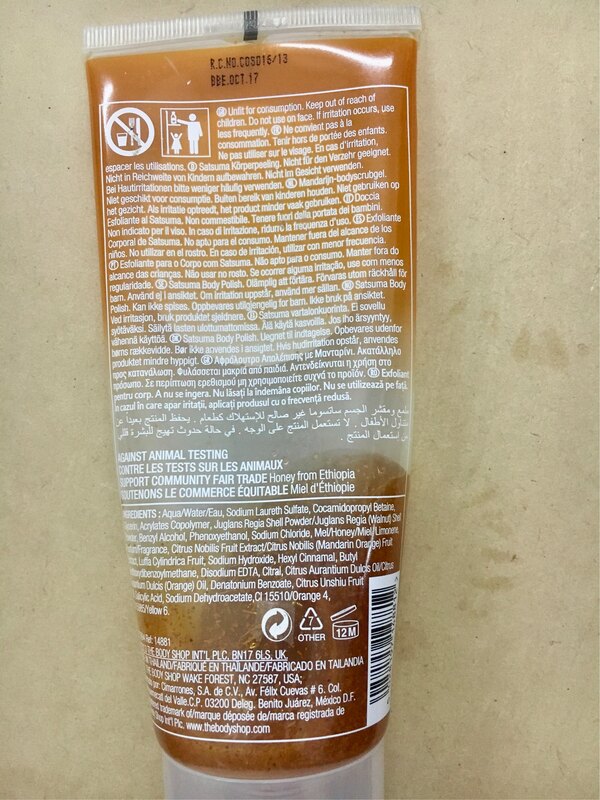 It has an orangish smell which is very refreshing. The fragrance stays well for about 2 hours. For me this scrub is an escape from the daily work regime. I use a small amount of the scrub initially and apply it to areas that require immediate action against the tan. Then I scrub using a loofah to remove any leftover granules that might get stuck if they are not removed properly. 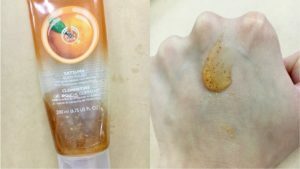 One of the things about The Body Shop products is that they are totally safe to use, even on the skin directly. One can use it without any problem regarding harsh chemicals. Most of the people with sensitive skin might I have an issue of developing rated after scrubbing, but I am sure this one would not cause any allergy. From the first wash itself, I could observe my skin glowing leaving behind a refreshing fragrance. By the end of the second week, all my tan vanished and my skin returned back to its natural skin tone with an added extra glow. I am really satisfied with this amazing tan removal scrub and this is going to be my constant savior, all through the summer. 2. Does not cause any rash or allergy. 4. Does not cause any dryness. 1. Removing it with simple water is time-consuming. Yes, I totally recommend this scrub which should be a must in everyone ones bathing routine, especially during summers! If you are lucky then you might get a good discount during the mid-season sale at The Body Shop. The Body Shop satsuma scrub is by far my favorite skincare product from The Body Shop. It comes with light granules that remove all the tan from the skin gently, leaving behind a mesmerizing smell. It does not make the skin dry or patchy. This one is the best scrub to use in summers to keep the tan away! If you liked this post or found it helpful then don’t forget to subscribe for more such posts.